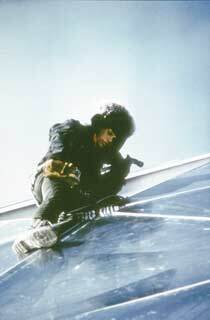 ...now for the rest of the story! 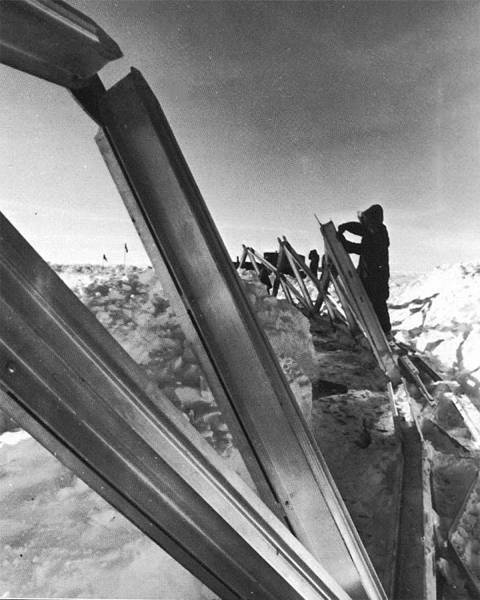 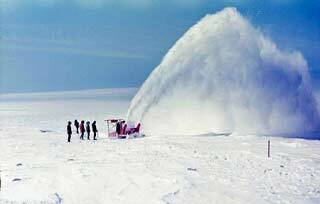 Here is a view of the early construction of the dome base ring from the 1971-72 season (Navy photo, Antarctic Journal (AJ) 3/72). 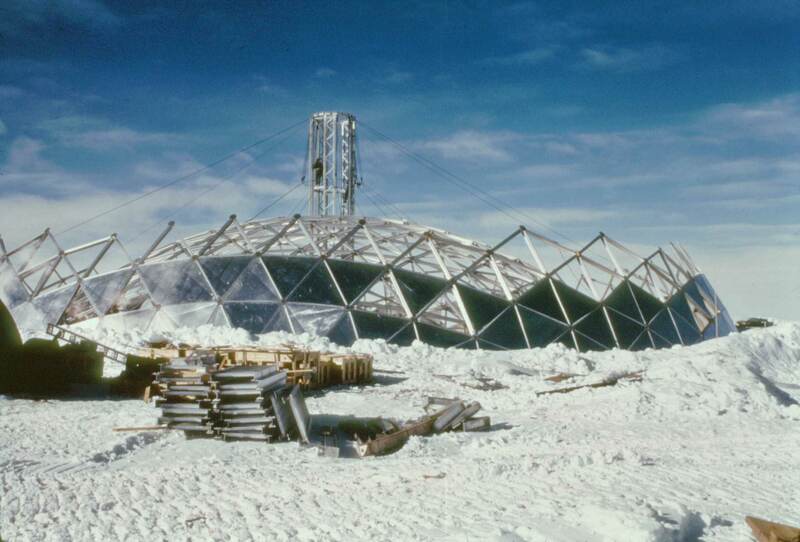 The dome snow foundation was complete on 19 January, and by the 22nd the base ring erection had begun. 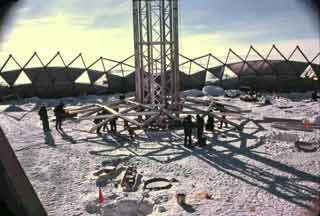 Very little of the ring actually got built during the first season. However, 80% of the 720' utilidor was completed. 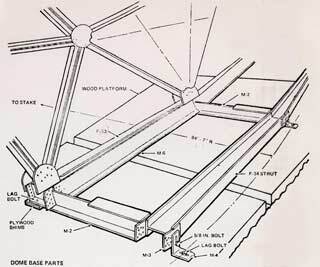 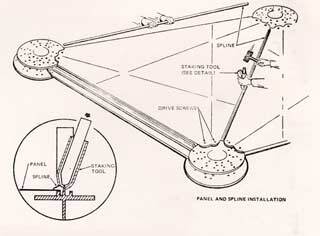 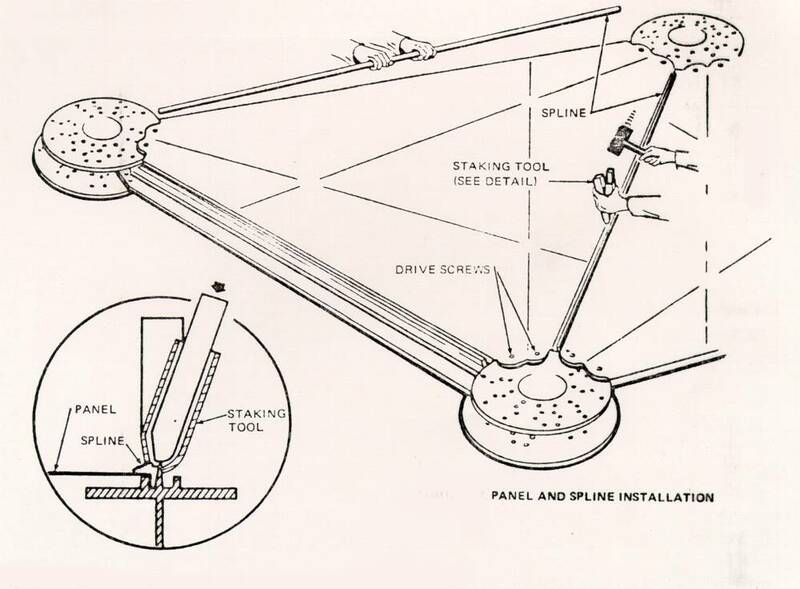 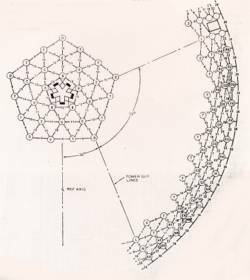 This diagram from the TEMCOR dome erection manual shows the details of the foundation base ring. The differential settlement of the timber pads underneath this foundation caused some of the aluminum nodes and base ring beams to break eventually, these were repaired in 1989-90. 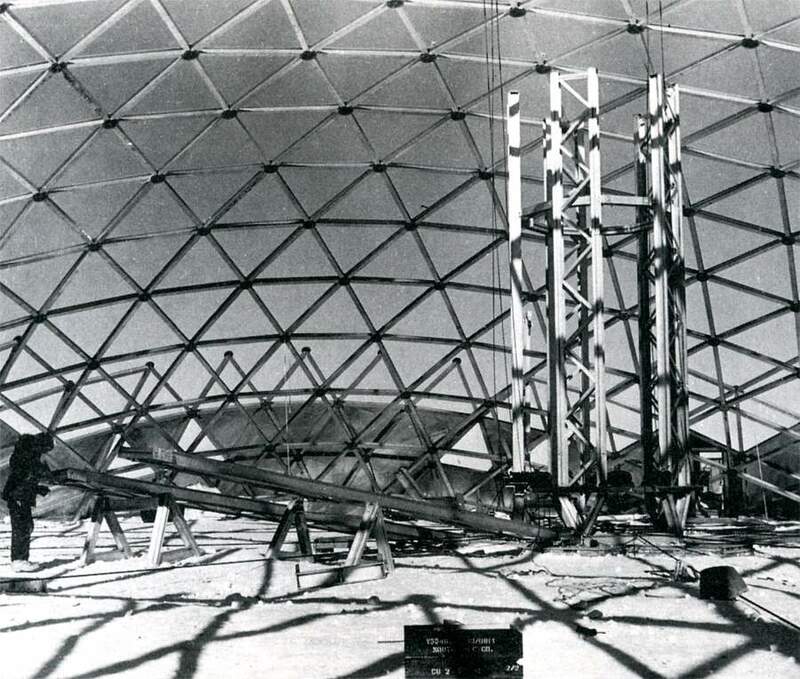 The photo at left (courtesy Bob Nyden from a 72-73 cruisebook) shows early construction of the dome ring, while excavation for the utilidor is also proceeding. 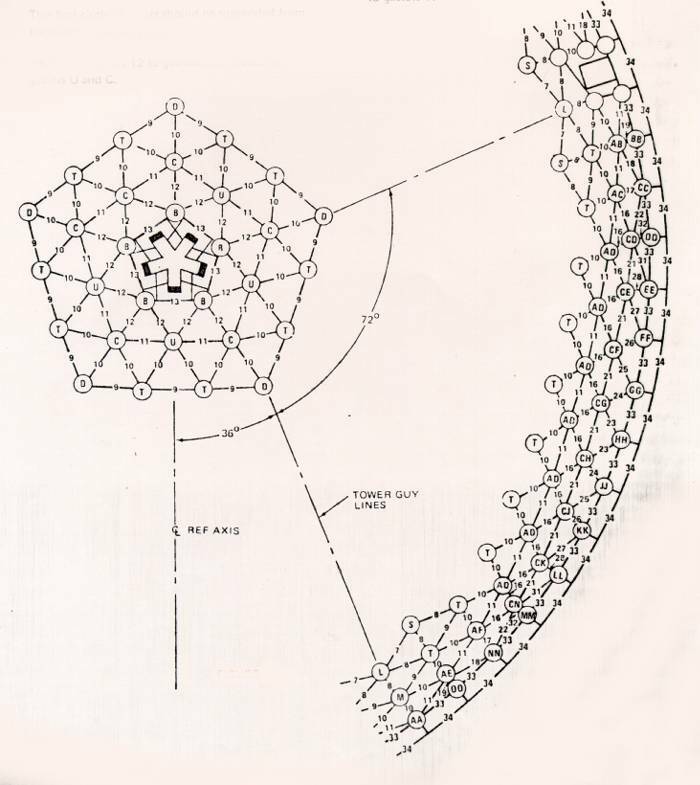 This page from the TEMCOR manual shows the central tower and the initial assembly of the upper portion of the dome. 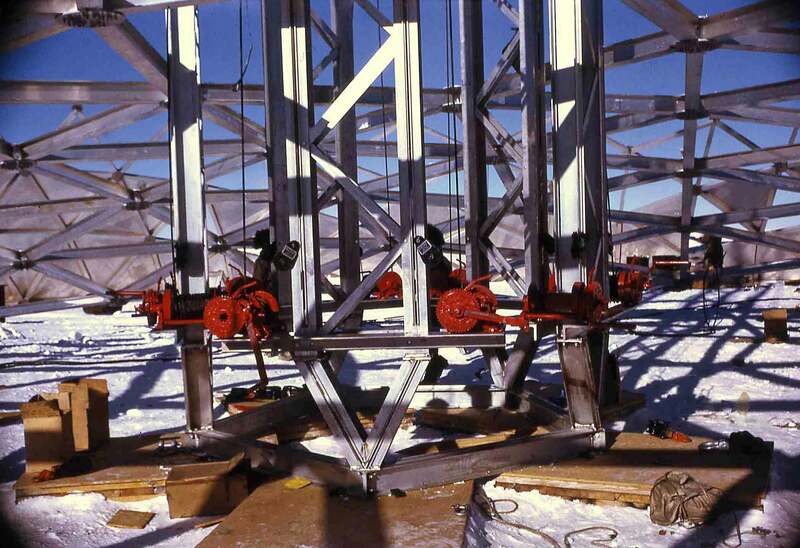 The 5-legged tower had 10 hand winches which attached to the upper portion, after each ring was added the assembly was pulled up and the next ring installed. 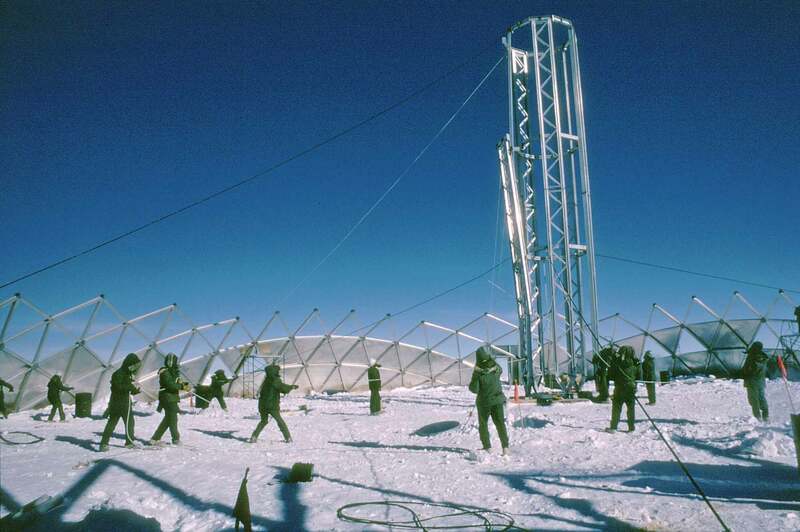 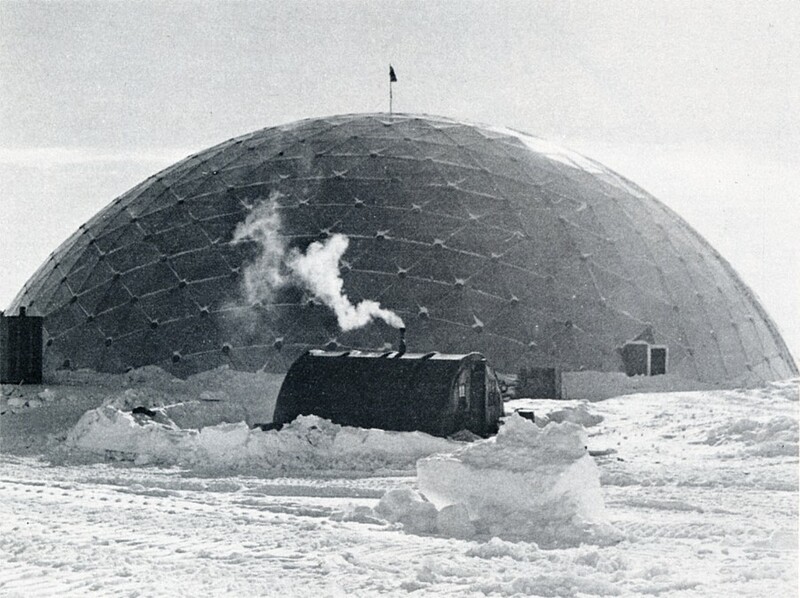 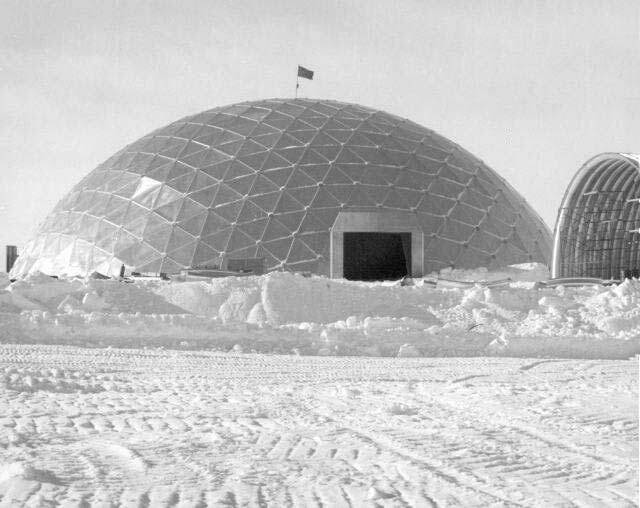 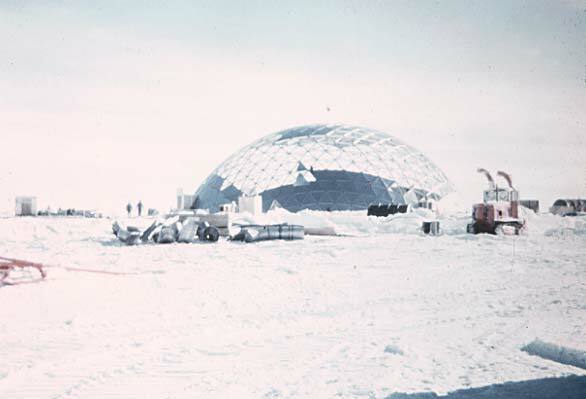 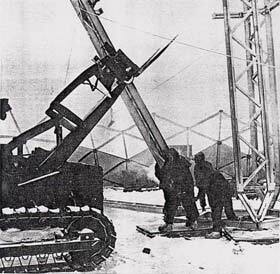 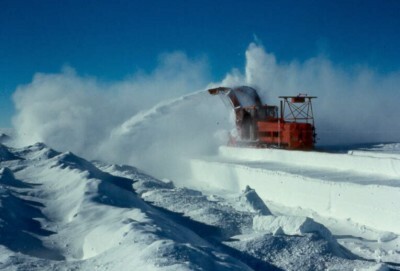 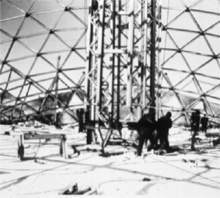 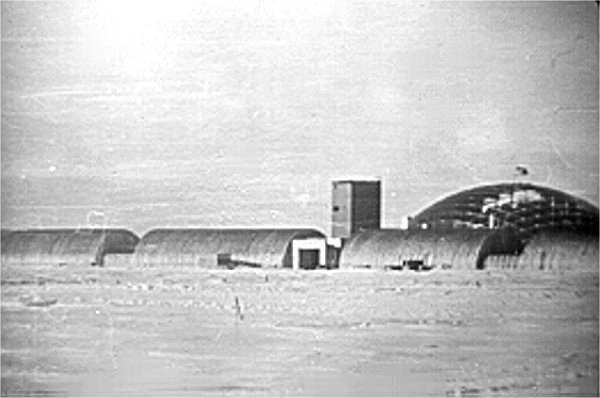 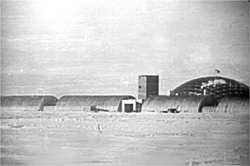 At right, later in the season (Navy photo, AJ 7/73) the dome upper portion assembly has been completed, with its outer edge resting on the snow surface. 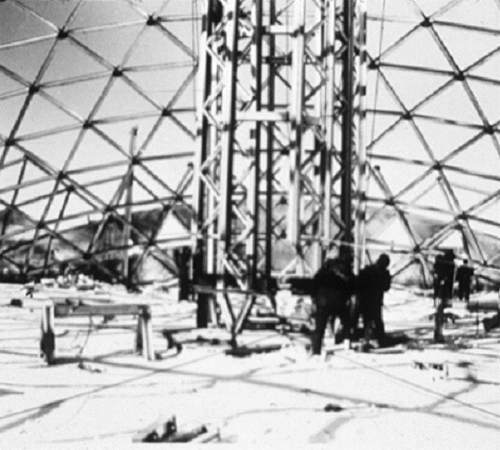 Here the central tower is being dismantled; portions of it will be erected at 10 equally spaced points around the edges of the upper section, to lift it up to join the lower portion of the dome ring, which is visible in the background. 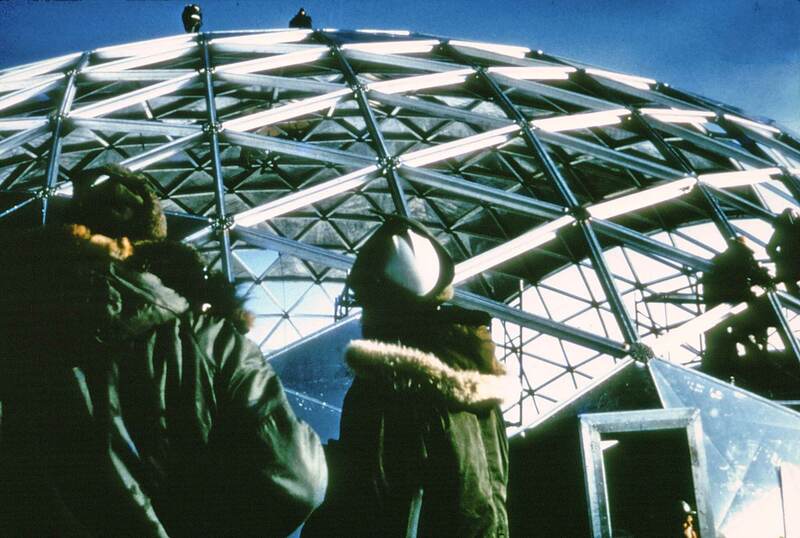 This page from the TEMCOR manual shows how the sheet aluminum dome panels are installed. 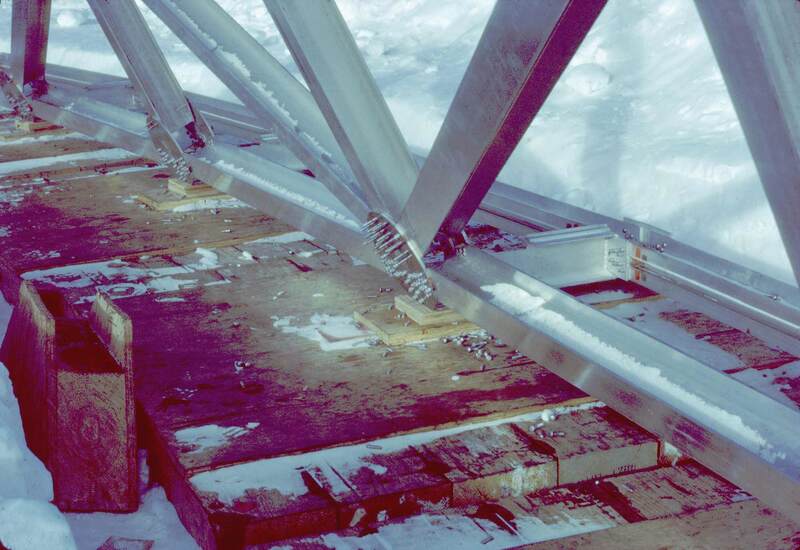 As you can see, removing the panels is rather difficult (as we found out in 1989-90; also all of the fasteners which connect the nodes (circular pieces) to the beams, are "Huck" fasteners, or aluminum rivet-like connectors which must be ground off to remove. Some of the reasons why nondestructive removal of the dome for reuse elsewhere might be a bit labor intensive. 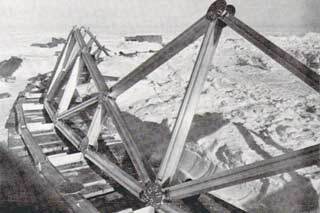 The last dome beam was installed on 4 January 1973. 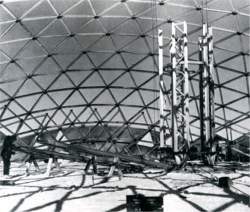 At left, the dome is fully erected, with panels being installed. 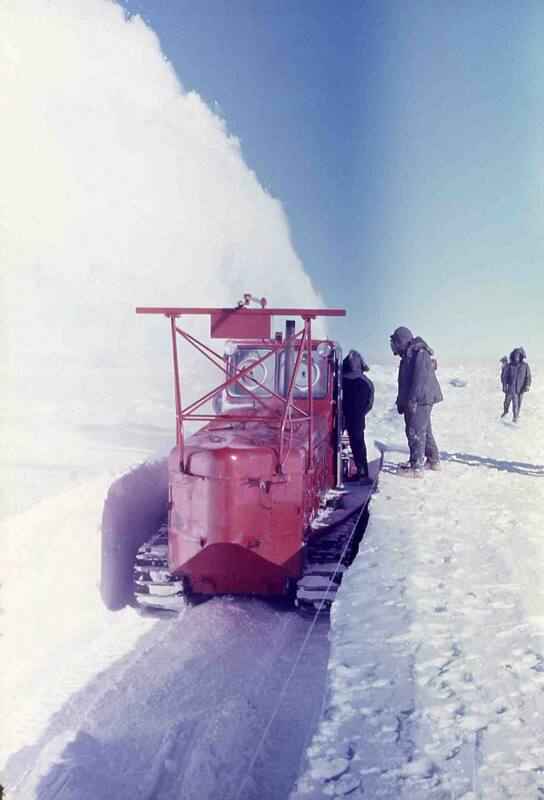 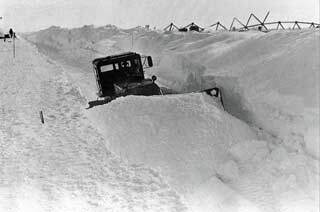 The machine parked in the right foreground is one of those Peter Snow Millers (photo from Bob Nyden). 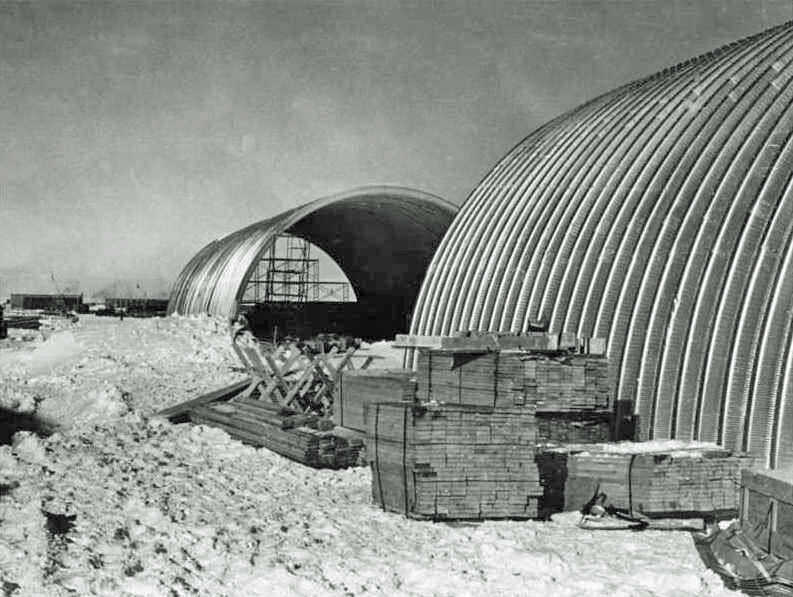 At right, the partially complete power plant and garage arches at the end of the 1972-73 season, boarded up for the winter (this and the next two pictures from Bob Nyden). Another view of the 2 partially completed arches at the end of the season. 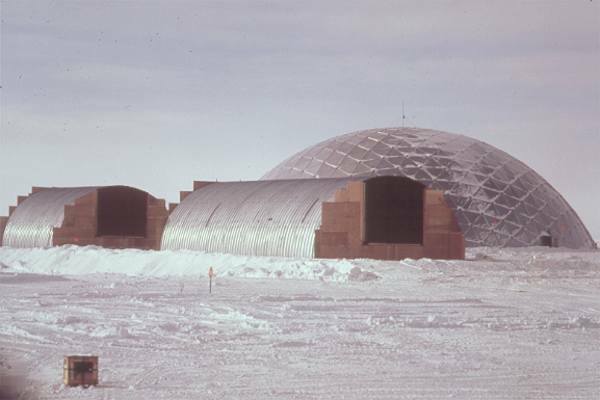 At right is a back view of the dome at the end of the station, taken on 25 January, 1973. 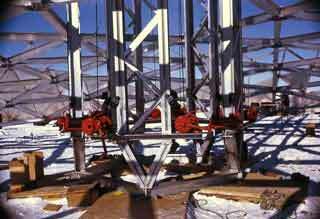 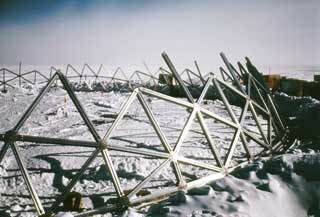 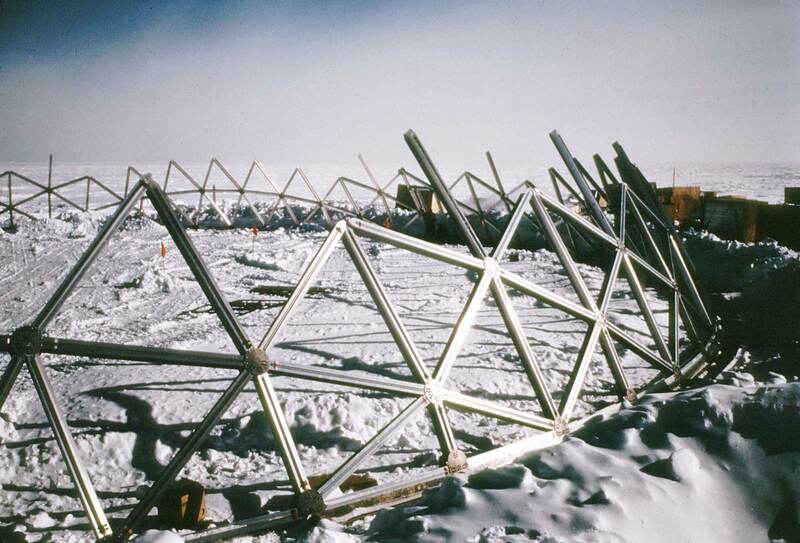 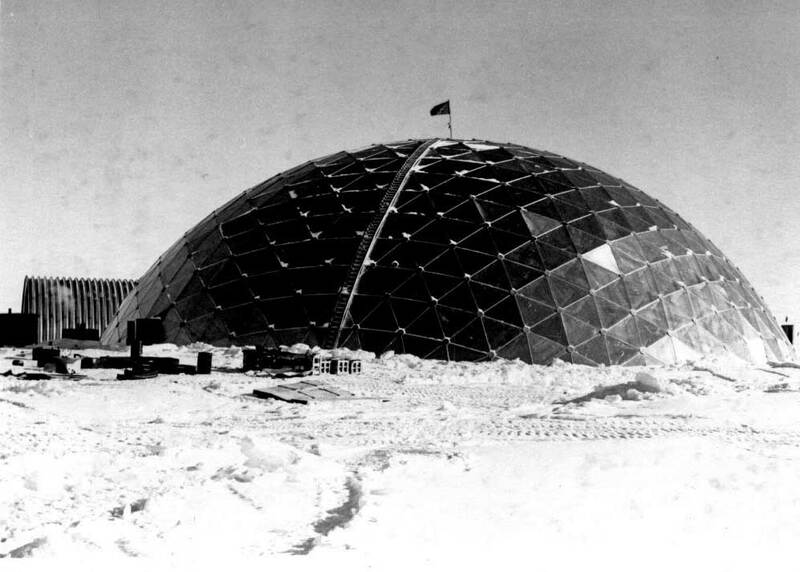 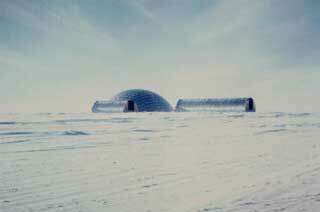 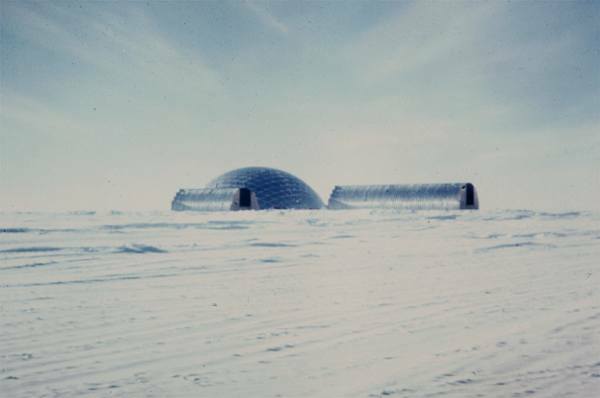 Caption: "The new geodesic dome at the South Pole Station, Antarctica. 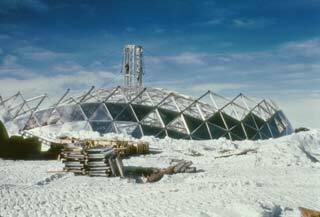 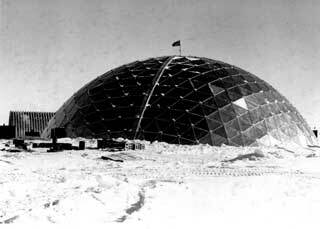 This dome will be used to cover and protect most of the buildings at the South Pole." 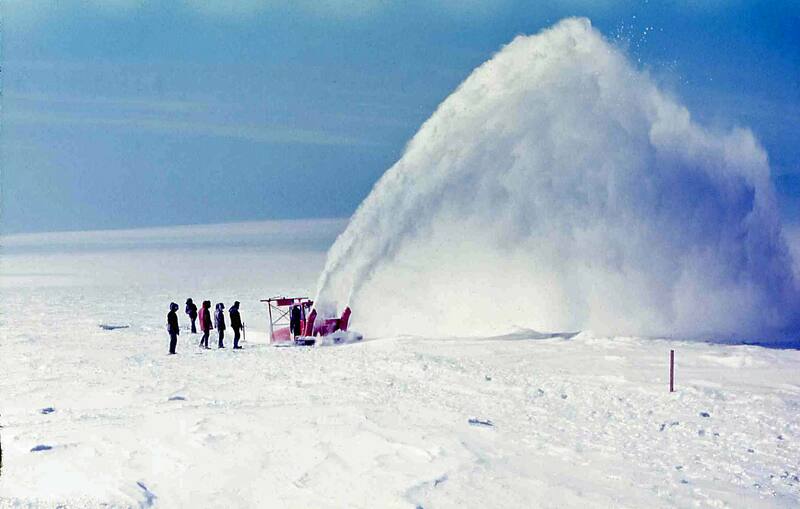 Photographer EA3 D. Nelson.